The front of the Imako Cosmetic Teeth® looks like a set of perfect teeth and gums. It extends three teeth behind the canine teeth to provide complete coverage even when you smile. Available in two sizes and colors; bleached (left) and normal (right). Bleached matches B-1 on the dental scale, or the whitest color in people, and natural matches A-2, the most common color. To select the best size for yourself, click here or on the photo to the left. The photo will open as PDF file which you can print, showing the product at exact size. You can cut out the two sizes and "try them on"! Or measure the distance across your four front teeth and purchase the size with the closest measurement. If you are unable to open the file, download the free and very useful Adobe Acrobat Reader software. This photo shows how the fitted Imako Cosmetic Teeth® actually clip onto your teeth. They add a very tiny bit to the overall size of your smile. Nothing interferes with your bite, which drives you crazy. Unlike a partial plate, no part of this device need be inside your arch. Here is a set that has been fitted, shown upside down. You can see that Imako is amazingly thin, just 1 mm. 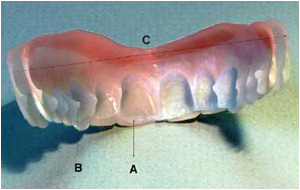 This is the same thickness that is added to your teeth if you had porcelain overlays. By physical law, Imako will add dimension to the existing dental structure, providing the wearer with a broader smile and more overbite...just like everybody in Hollywood! Shown from the back after being fitted. Once fitted you can snap the flexible device onto your teeth anytime without dental adhesives. By having the imprint of your teeth on the inside, they are able to grip because of matching surfaces. The front layer is flexible, while the fitting layer inside gives stiffness and strength. The fitting layer can be melted as many times as necessary to get the fit right. A. A small ledge under front biting surface keeps Imako in position. B. Projections fit between your side teeth to lock Imako in place. 3. Imako flexes outward to take off and put on. When your Imako Cosmetic Teeth® arrive, it looks like this viewed from the back. 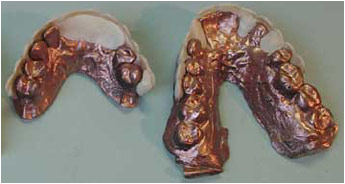 Place your mouse over the picture to see what Imako Cosmetic Teeth® look like after being fitted to an individual. Because nothing interferes with closing your bite, you can speak clearly and drink but we do not recommend eating while wearing the device. The Imako cosmetic shell can handle almost any dental condition except buck teeth or an underbite. When you purchase Imako, you get a bit of extra fitting material in two colors: gum and white. You can use the extra fitting material provided to shore up areas where teeth are missing. You use the pink color to build up above the gum area at the top to strengthen the fit and smooth the transition between your gum and the device. We have no solution for bottom teeth because your upper teeth would dislodge a product like this. Imako is made in the USA of FDA approved materials. Here are 2 more models showing how Imako can be customized for an assortment of dental conditions. You cannot use this product with braces as they would lock together. On the left is the Snap-On Smile® (starting at $1500) and on the right, the Imako Cosmetic Teeth® after being fitted. Note that you will be unable to close your bite while wearing the Snap-On Smile®, and this will make you speak with a lisp and could cause TMJ, a painful misalignment of the jaw. Trust the superior, minimalist design of Imako Cosmetic Teeth® to deliver a comfortable and beautiful smile. p>Imako® is not a dental device and not therapeutic. Not for eating and not for braces.